Falling off the bone, juicy chicken with an amazing garlic sauce. If you have never had roasted garlic this is a great way to try it. Roasting the garlic really mellows out the flavor. Don't skimp on the garlic- it's not a misprint. 4 whole heads of garlic, separated into cloves with just the thin papery outer skin removed. Pre-heat the oven to 350 degrees. Wash and dry the chicken quarters. Heat a large skillet over medium high heat. Add the oil and butter to the hot pan. Swirl to coat the pan. Place chicken skin side down in the hot skillet. Cook until browned, about 5 minutes. Turn the chicken over and brown the other side. 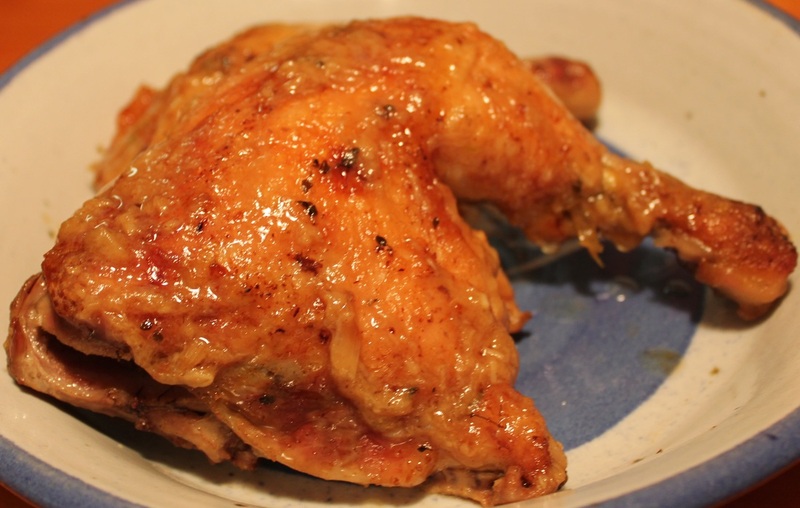 Remove the chicken and place it in a glass-baking dish. Add all the whole un-peeled garlic cloves to the skillet, stirring well. Pour the lemon juice over the top of the chicken in the baking dish. Sprinkle the thyme over the chicken. Place the garlic cloves around the chicken. Cover the baking dish, bake for 1-1/2 hours. To make the sauce, mash the garlic and add to the chicken juices mixing well. Serve the roasted garlic sauce over the chicken pieces.